It’s Valentines week – love is in the air and there is candy flowing everywhere. What are you going to do with all of the candy your child brings home on Thursday afternoon? Don’t eat it…experiment with it. Fill a clear glass with 7-Up, Sprite or other carbonated drink. 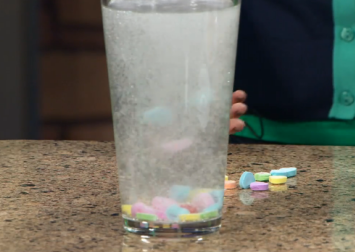 Drop a handful of candy conversation hearts into the soda. Watch the hearts dance up and down in the carbonation. The carbon dioxide picks them up and throws them to the top of the glass. When they reach the top, the bubbles burst and the candy works its way down again. Fill a clear glass or bowl half way with water. Drop a few M&M’s or Skittles into the water. Wait about 10-20 minutes to let the candy soak. The “M” and “S” letters on M&M’s and Skittles are printed in edible white ink. The ink won’t dissolve in water. When the candy shell dissolves, the letters peel off and float to the top. Pour an entire packet of Pop Rocks into a balloon. Stretch the mouth of the balloon over the opening of a bottle of soda. Carefully to avoid the Pop Rocks from spilling into the soda. 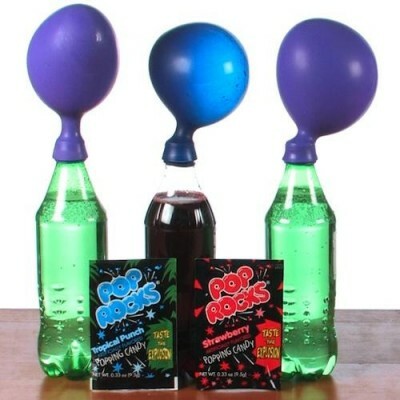 When it’s secure, dump the balloon over and empty the Pop Rocks into the soda. The secret behind the famous “popping” of Pop Rocks candy is pressurized carbon dioxide gas. Each of the tiny little candy pebbles contains a small amount of the gas. These tiny carbon dioxide bubbles make the popping sound you hear when they burst free from their candy shells. Drop a Gobstopper of different color along each side so that they are across from each other and evenly spaced. 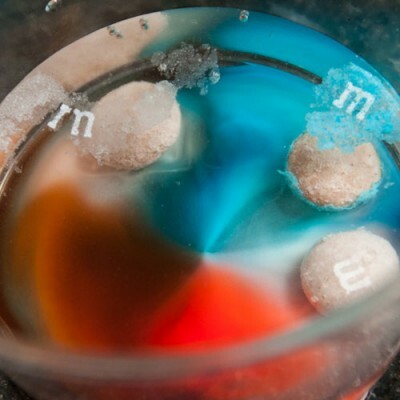 Try this experiment with other dyed candies, like M&M’s Skittles, Lifesavers. Do they all work the same? Try it with different liquids, like milk, vinegar or soda. Do the colors spread the same? 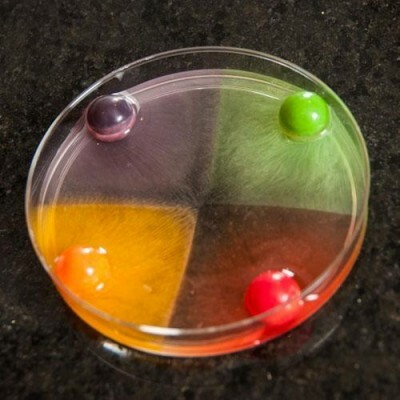 Now try putting two Gobstoppers in a petri dish, then three. What happens? Finally, test different temperatures in the water. What happens to the dissolve rate in cold water or hot? The surprise here is that the Gobstopper colors don’t actually mix together in the dish. Instead, they run into each other and stop. As the candies dissolve, the concentric layers of color disperse into the surrounding water but adjoining colors do not readily mix to form new colors. This is because a thin layer of food-grade wax surrounds each color layer and inhibits mixing. Further, the colored water forms clearly defined shapes in the dish and can change color over time. This is because each Gobstopper is comprised of different layers of colors (food dyes). They’re pretty tasty and, in this case, pretty and tasty! Gobstoppers® is a registered trademark of NESTLÉ® USA. My daughters had a blast performing the Rock Pop Expander! I used the experiment to expand on the 5 senses for my Kindergartner and preschooler. Thanks so much for this post. We can’t wait to try them all.